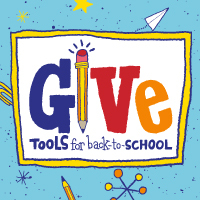 More than 1,100 Publix stores will have a “Tools for Back to School” display near the front of the store. The display will include tear-off tickets valued at $5, $7 and $10. Customers may tear off a ticket and give it to the cashier when they check out. The amount on the ticket will be added to their grocery order. Customers who donate will receive a Publix reusable bag. In metro Atlanta, the school supplies will be shipped in bulk to the Atlanta Community Food Bank to be distributed to schools that are part of the Kids In Need program. Items donated will include notebooks, crayons, color pencils, markers, #2 pencils, notebook paper, folders, scissors, and glue.